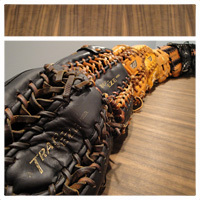 WWW.GLOVE-WORKS.COM BASEBALL GLOVE COLLECTOR FORUM • View topic - My not so humble collection.. As a noob..
Post subject: My not so humble collection.. As a noob.. I will give some details tonight when I have more time. For now. I will up some photos. Post subject: Re: My not so humble collection.. As a noob..
nice collection. Those Franklins are very underrated. Thanks, My collection changed a little bit since I joined the forum. When I have time this weekend I will update this post. Both Franklins were sold @ $50 a piece. Who ever bought them def. got their monies worth. I paid $25 a pop. Would have kept them, but as you can see, My Rack is bursting with gloves.